Community Events for Calendarize it! | Calendarize It! Community Events for Calendarize it! 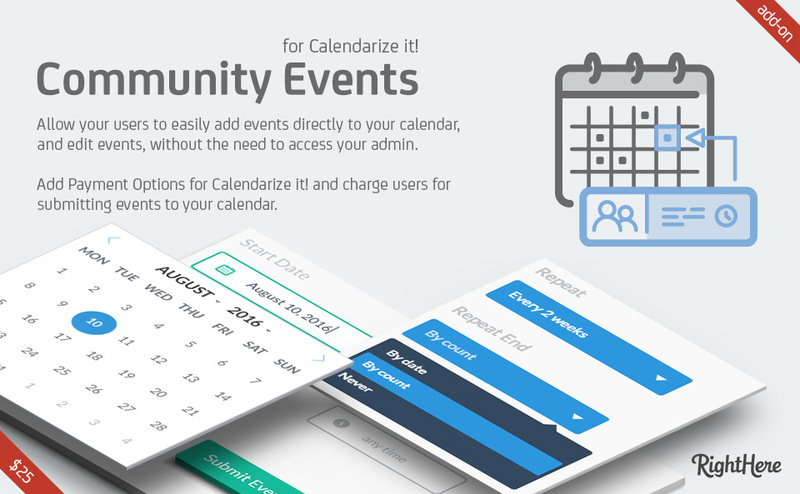 Community Events add-on for Calendarize it! allow your visitors to submit free or paid Events to your calendar from the front end of the website. You can allow your visitors to log in using social networks like Facebook, Twitter, LinkedIn, Google+ or with WordPress login. We also allow you to set the capabilities for each user role in WordPress. By doing this you can allow some visitors to submit events without having to be reviewed. Maybe you want some visitors to be able to create their own Taxonomies (calendar filters). This is can easily be done by setting the capabilities in the Community Events Access tab. If you get the Event Payments add-on you will be able to charge your visitors for submitting events when they use the Community Events add-on. If you have Calendarize it! Advertising add-on you can also charge your visitors for advertising on pages where you use Calendarize it! and on the Map View add-on. Let your users submit Events to your Calendar directly from the frontend of your website. When you have purchased, downloaded and switched the button from OFF to ON you can go to the Community Events menu and enable the features and configure the different settings. Community Events add-on for Calendarize it! allow your visitors to submit free or paid Events to your calendar from the frontend of the website. You can allow your visitors to login using social networks like Facebook, Twitter, LinkedIn, Google+ or with WordPress login. We also allow you to set the capabilities for each user role in WordPress. By doing this you can allow some visitors to submit events without having to be reviewed. Maybe you want some visitors be able to create their own Taxonomies (calendar filters). This is can easily be done by setting the capabilities in the Community Events Access tab. You can easily select which Taxonomies (calendar filters) you want to show in the Community Events form on the website by turning them ON or OFF in the options panel. If you need custom fields in the Community Events form you can easily create your own in the options panel. If you enable the different Social Networks you can easily change the order of the icons in the Community Events page by simply using the drag and drop interface in the options panel. Users that submit events can select between the Taxonomies available on your website, or if you allow, they can create their own Taxonomies. In the General Settings tab you can limit the number of custom Taxonomies they can create and also set a maximum on the number of pending events each user can have. 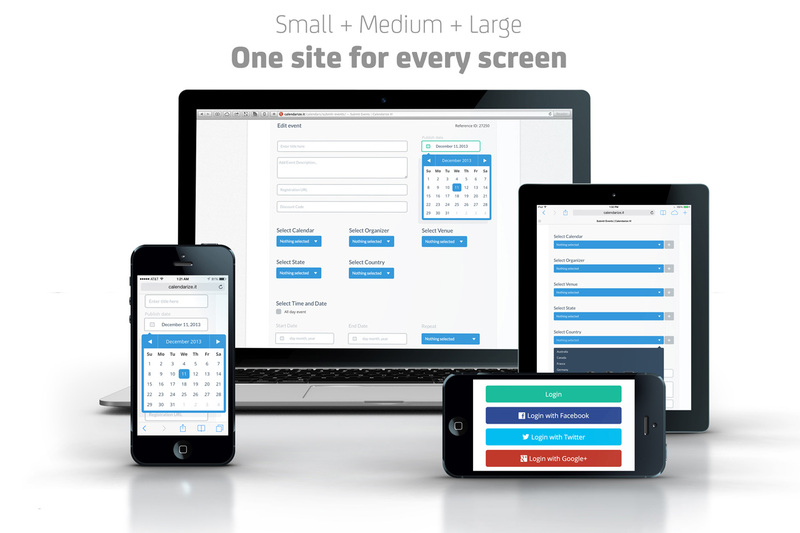 Users can easily create All day events or set Start Date, Start Time, End Date, End Time and even make Repeat events. The Community Events form is also optimized for mobile platforms. You can set the capabilities to allow uploading images to the Event. The Community Event form supports uploading the Featured Event Image, which shows in the pop-up in the Calendar Month View. The Event Page Top Image, which is the image that shows in the top of the Event Details page and the last image is the Event Details Box Image. When the user clicks Submit Event the event will be published directly to Calendarize it! if the user has the rights (capabilities) to do so. If not, then the event will be pending review in the WordPress administration. Compatibility Fix: Add the third parameter to save_post to avoid crashes on sites using certain plugins that expect it to be defined (Beaver Builder). According to the WordPress codex, this is not required, but some plugins expect it. Bug Fixed: CSS Alignment with + and drop-down filters. Bug Fixed: Some websites experienced issues with allowing Subscribers, Contributors, Authors, and Editors to upload images through Community Events. Update: Added backward compatibility to previous bug fix. Compatibility Fix: Drop Downs in Community Events form hidden on some themes. New Feature: Added the future parameter to the community_events_edit shortcode, so that scheduled events can also be listed in the frontend. Bug Fixed: Under some circumstances, when a visitor who submits an event has a different time zone than the time zone set in WordPress, the date and time will get changed. Bug Fixed: When fixing a bug in the previous release this broke the time picker. Bug Fixed: A Missing object in Visual Text Editor when disabled caused Submit Events to fail. Bug Fixed: Hiding description from form was broken after adding support for WordPress Visual Editor. Bug Fixed: Capability compatibility issue with WordPress Media Library, caused subscribers to not be able to upload images. New Feature: Added support for uploading images to Media Library and accessing Media Library when editing events and adding new events. Compatibility Fix: Added option to set the Event to Publish instead of Future (Published/Scheduled). This helps with some sites where the event is set to scheduled and never changes to published for some (yet) unknown reason. This is a partial fix that helps sites that experience this issue, but do not need to schedule Event Publish Date. Bug Fixed: When editing an event it loses the Date and Time formatting what was set when the event was entered. Fixed Bug: Problem with Date picker when using Spanish, Portuguese date format j \d\e F \d\e Y.
Update: Prevent users from being able to type Date and Time manually. Can only be picked using the Date and Time picker. This will prevent the Date and Time picker from crashing when users custom settings for WordPress Date and Time formats. Bug Fixed: Issue with j F, Y date format. Using comma in the dateformat was brekaing the date picker. Bug Fixed: Date Picker is empty when custom date format jS F Y is set. Implemented new process for reading the date data. Bug Fixed: Issue with saving the events start date and start time (related to new Date and Time picker). Improvement: Added new Date and Time picker to improve user experience. New Feature: Added support for Accordion Upcoming Events Widget call to action link custom fields URL and label. Bug Fixed: When field validation is active, submit events never passes the validation. Update: Make General Settings tab show first in Options. Bug Fixed: When hiding create term + button, the form is still showing in some sites. New Feature: Added the filter ce_front_taxonomies to allow filtering the terms that are displayed in the Community Events form. New Feature: Added attribute publish and pending to the community_events_edit shortcode so that pending events can be added to the list. Bug Fixed: In WordPress 4.1 add Event Page opens with the error “Unable to initialize term, contact support for assistance. Content, title, and excerpt are empty“. Bug Fixed: Use current_time instead of time. Events in some cases are not getting published immediately. Update: Change email from to site blogname and admin_email. Add support for render as HTML. Update: Do not set publish date if it comes empty. New Feature: Show pages with the Community Events shortcode in Options. Update: Add a hash that triggers a dummy “end message” so that it can be visible for the CSS Editor. Bug Fixed: Language file not loaded correctly. Bug Fixed: Add support for loading scripts on demand. New Feature: Allow selecting an event color in the frontend from predefined colors set by admin. New Feature: Added option to customize status labels on the list shortcode by argument like this status_publish=”Published” or status_pending=”Pending”. Bug Fixed: Internet Explorer not setting dates correctly in form. Bug Fixed: When creating a draft it was set to auto-draft, but when retrieving previous it was looking for draft not auto-draft, hence breaking payments. New Feature: Added Support for new Social Connection menu for entering API Keys for each Social Network. When a add-on uses Social Connection the API Keys are read from this location. Bug Fixed: Paid Events submitted through Community Events add-on using Payment Options add-on was not expiring. Bug Fixed: When adding a new Taxonomy do not clear the Event Meta fields, only the Taxonomy fields. Bug Fixed: Change “Add files” button to anchor. When clicking “Add files” in Firefox it reloaded and lost the ID. Bug Fixed: Error occur when using drag and drop in Firefox to upload images (Error generating draft). Bug Fixed: Do not define an event color on Community Events submit so that Event Color by Calendar (taxonomy) can be used for Community Events. Update: Added hook for Payment Options control before_ce_form_login. Makes it possible to display products before the user is logged in. If user is not logged in and click on a product the Social Connection (login) will display. New Feature: Add option to add label for custom images. Bug Fixed: Labels for images not showing, and images using the number of fields to display fields.